See working demos of miniature light guides, light guide-based 7-segment displays and illuminated switch caps for dome switches, all in “technicolour action”. View the video to fully understand how these components can enhance your products! Of course, you can find out more in the Light Guides Micro-site. Press Release:- Miniature, half-pitch light-guides from MENTOR GmbH. 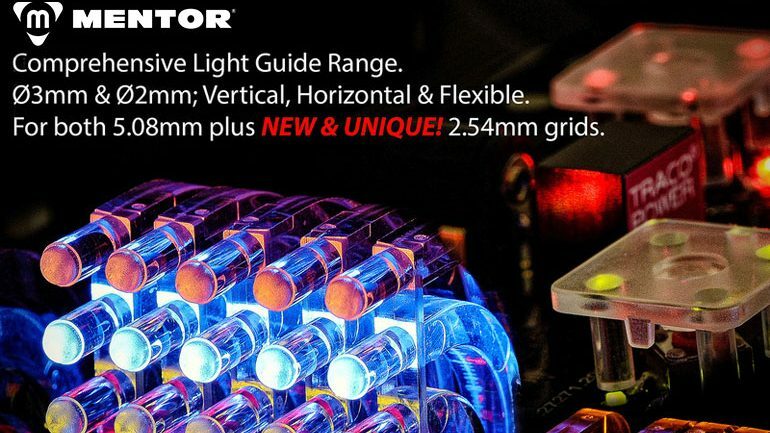 Multitron has announced the availability of a new range of MENTOR miniature light-guides with radiating surfaces of 2mm diameter and a grid dimension of 2.54mm. Compared with conventional 5.08mm grid light-guides, these new miniaturised versions allow twice the number of display elements within the same physical width. This offers design engineers a whole new range of possibilities, particularly when space is restricted. Read our updated 2018 information here.